I was in Prince Edward County for the last few days exploring this magnificent region of Ontario and sampling its food and wine. At one of the stunningly picturesque wineries we visited, there they were — a golden girl playing joyfully with a golden dog. It felt like a scene out of a wonderful dream of times past. I used a layer Kim Klassen’s Dream-it texture on this and I’m joining in the parties at Texture Tuesdays and Sweet Shot Tuesdays. Yes, me too. It’s an added bonus. Love the golden girl with the golden dog! I love how a lot of wineries have dogs, it always makes me happy to visit them. Such a gorgeous and dreamy shot! Fabulous texture work! Wonderful shot, so beautiful in its simplicity – the composition and texture treatment set the mood perfectly. Yes, Stan gets full points! Thank Cathy. Admire your poppies too! Thanks! Love what you did with your new macro lens too. A wonderful tangible result of some of the amazing serendipity of our weekend travels! Can wait to see more of your work from Prince Edward County. This looks like a fine painting! great processing and subject matter! Wonderful capture… so much fun and the golden colors are really lovely. Thanks, Mary Lou. I feel very fortunate to have been there. They were playing with pure abandon. The image makes me feel happy every time I look at it. Oh my goodness, Sherry! What a perfectly joyful moment you captured! Beautifully expressed. Thanks for the kind comment. I dropped by your blog too. Totally perfect…glad you were there and ready with your camera. Fantastic so 50’s I love it ….sigh…. 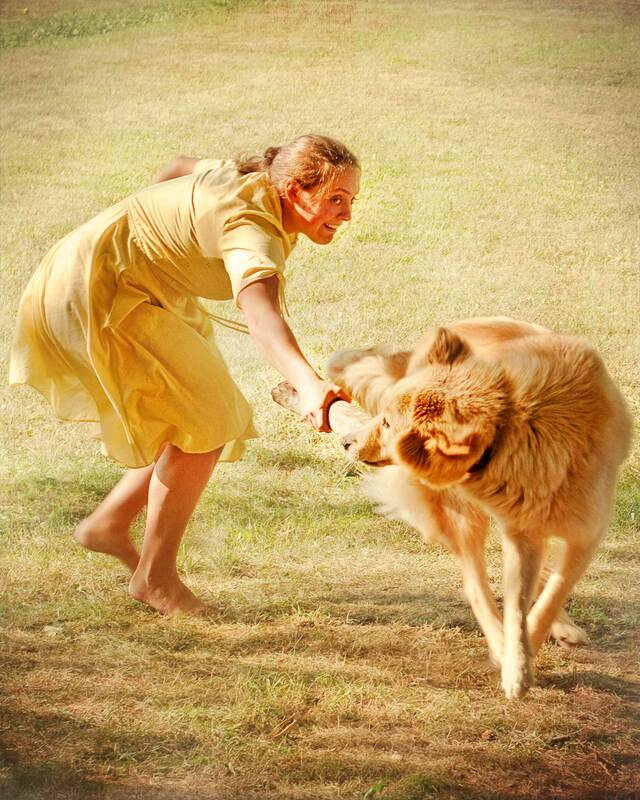 I like the way you describe the scene….”the golden girl playing joyfully with a golden dog”. It reminds me of the Normal Rockwell paintings.